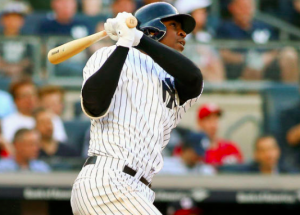 The New York Yankees have officially clinched a spot in the American League Wild Card Game, but whether they’ll have shortstop Didi Gregorius in that game is in doubt. Gregorius hurt his wrist while sliding headfirst into home plate during Saturday’s walk-off win. An MRI performed Sunday revealed torn cartilage in his wrist, an injury that could potentially end his season. Gregorius received a cortisone shot on Sunday. The team will give him a few days to see how he responds to that and then re-evaluate him. With seven games left in the regular season, the Yankees don’t have a lot of time to figure out his status. Gregorius insists that the cartilage tear is small. He also says he didn’t feel any pain until the morning after his headfirst slide. Gregorius has also hinted that he’s willing to play through a little pain in order to make it back for the Wild Card Game on October 3. If Gregorius can’t play, Adeiny Hechavarria is one possible replacement. Hechavarria hasn’t contributed much offensively this season, but he does provide the Yankees with a quality defensive player at shortstop. The other option is moving Gleyber Torres to shortstop, which is his natural position. That would require inserting Neil Walker at second base. Walker has had some positive moments in the second half of the season but has been overall disappointing. Ronald Torreyes and Tyler Wade could also be options for the empty middle infield spot. However the Yankees choose to replace Gregorius, there is bound to be a drop-off. Outside of deciding home-field advantage in the Wild Card Game, New York’s last seven games are rather meaningless. But not getting Gregorius back for the one-game playoff would be a huge blow for the Yankees and could end up making a difference. At the moment, Gregorius seems intent on playing again in 2018. But whether the wrist injury will hinder his performance is another issue. The injury to Gregorius is just one more reasons for the Yankees to be a little nervous heading into next week’s Wild Card showdown.